Quick overview In 1930s Paris, where one cheap hotel room is very like another, a young woman is teaching herself indifference. She has escaped personal tragedy and has come to France to find courage and seek independence. She tells herself to expect nothing, especially not kindness, least of all from men. Tomorrow, she resolves, she will dye her hair blonde. 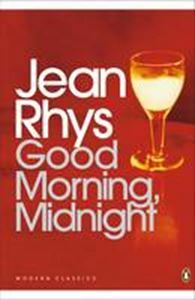 An unforgettable portrait of a woman bravely confronting loneliness and despair in her quest for self-determination, Jean Rhys' "Good Morning Midnight" includes an introduction by A.L. Kennedy in "Penguin Modern Classics". In 1930s Paris, where one cheap hotel room is very like another, a young woman is teaching herself indifference. She has escaped personal tragedy and has come to France to find courage and seek independence. She tells herself to expect nothing, especially not kindness, least of all from men. Tomorrow, she resolves, she will dye her hair blonde. Jean Rhys was a talent before her time with an impressive ability to express the anguish of young, single women. In "Good Morning, Midnight" Rhys created the powerfully modern portrait of Sophia Jansen, whose emancipation is far more painful and complicated than she could expect, but whose confession is flecked with triumph and elation. One of the most honest and distinctive British novelists of the twentieth century, Jean Rhys wrote about women with perception and sensitivity in an innovative and often controversial way. Jean Rhys (1894-1979) was born in Dominica. Coming to England aged 16, she drifted into various jobs before moving to Paris, where she began writing and was 'discovered' by Ford Madox Ford. Her novels, often portraying women as underdogs out to exploit their sexualities, were ahead of their time and only modestly successful. From 1939 (when "Good Morning, Midnight" was written) onwards she lived reclusively, and was largely forgotten when she made a sensational comeback with her account of Jane Eyre's Bertha Rochester, "Wide Sargasso Sea", in 1966. If you enjoyed "Good Morning Midnight", you might like Rhys' "Voyage in the Dark", also available in "Penguin Modern Classics". "Her eloquence in the language of human sexual transactions is chilling, cynical, and surprisingly moving". (A.L. Kennedy).